Our Baby Book Club program restarts after a summer break on Friday, September 14th at 10:30am. We’ve had a resounding success in terms of families that we’ve encountered and encourage through this weekly time of early literacy activities, fun and special time. Began in early 2012, the group is strongly going, creating a new community of younger parents and caregivers from across Rockridge and Temescal. Born of elder Margaret Smith’s response to the question : “how can I use my gifts to participate in what God is already doing in our world?”, the Club is an active and vibrant collaboration with our neighbors and a reflection of what faith means for us as individuals and a community. Margaret works as a children’s librarian at the Walnut Creek library where she leads several such early literacy groups and programs for caregivers and young children. 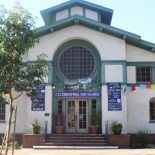 The Club meets every Friday from 10:30-11:00am in the Sanctuary space at 5951 College Avenue. Look for regular updates about the Club in our weekly newsletter and with the hashtag #capcoakland on Twitter (you can sign up to follow us in the middle window below). Here’s a video clip of what it involves and how it looks if you’re interested in checking it out online before coming to a club gathering. This entry was posted on September 10, 2012 by capcoakland in Baby Book Club and tagged Baby Book Club.